The IRI has developed a forecast maproom that characterizes the expected fire activity in the Amazon based on climate conditions for the upcoming dry season. Kátia Fernandes, along with Walter Baethgen and Lisa Goddard, have been researching how the Amazon fires are influenced by large-scale ocean phenomena and how sea surface temperature (SST) forecasts can predict fire occurrence for the upcoming dry season. Here, Fernandes shares the team’s findings for 2016 and some of her thoughts on the topic. In the video above, she gives a detailed overview of the maproom. We’re forecasting the July-September fire season to be more active than normal because we expect weather conditions during this same time period to be drier-than-normal. 2. What are they key driving forces resulting in these fires? Schematic of the Inter-Tropical Convergence Zone. The exact location of the ITCZ varies and is not always directly over the equator. Fires in the Western Amazon occur primarily as a result of dry conditions triggered by anomalously warm sea-surface temperatures in the Northern Tropical Atlantic. Warm waters in this region often cause the Intertropical Convergence Zone (ITCZ), the area near the equator where tradewinds converge (see figure), to shift northward. These trade winds typically bring moisture from the Atlantic to the Central and Western Amazon. The migration of the ITCZ causes trade winds north of South America to weaken, and when they weaken, less moisture is transported to the Amazon. The team at the IRI is forecasting that the upcoming July-September season in the Amazon will be anomalously dry. Consequently, they are expecting the upcoming fire season to be above normal. Sea-surface temperature anomalies over the North Atlantic during the period of Feb-Apr 2016. Data source: NOAA. Figure created with the IRI Data Library. On a longer time scale, the El Niño-Southern Oscillation also influences the climate of the Western Amazon. 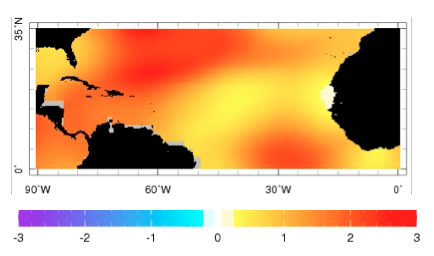 For example, as researched by IRI’s Alessandra Giannini, surface waters of the North Tropical Atlantic tend to warm up approximately 2-4 months after the peak of an El Niño. The figure at right is a map displaying SST anomalies over the North Atlantic during the period of Feb-Apr 2016, which is the period that follows the peak of the 2015 El Nino. It shows that most parts of the tropical North Atlantic are experiencing warmer than normal conditions during the months after the 2015 El Nino. Decadal variability in both the North and South Atlantic also exerts influence on the Amazon’s climate. For example, in a study conducted with the Center for International Forestry Research (CIFOR), we found that higher frequency of Amazonian droughts are observed when sea-surface temperatures in the North Atlantic are warm relative to those in the South Atlantic during April-September, and that has been the case since 2004..
Climatologically speaking, all signs point towards a significant uptick in the intensity and frequency of fires in the Western Amazon this year. 3. How does the Amazon situation compare to the 2015/16 forest fires in Indonesia? First, it’s important to note that the fire forecast we make is based solely on climate indicators. There are other factors that determine the extent of fires in the Western Amazon, including vegetation cover, burn practices and the effectiveness of fire management. A full comparison between the Indonesia fires of 2015/16 and the Amazon fires of 2016 can be reliably made only after the Amazon season ends in September. Explore anticipated fire activity in the Western Amazon Fire Forecast maproom. Another aspect that differentiates the two cases is that fires in Indonesia can occur in drained peatlands, and these can burn underground for months, as we observed in 2015/16. Such fires are also one of the biggest contributors to hazardous pollution in Southeast Asia. In the Amazon, peatlands fires are non-existent and vegetation fires do not last nearly as long. Nonetheless, during very dry years higher frequency of fires is related to an increase in cases of respiratory illnesses. 4. Discuss briefly the impacts of the last major fire season in the Amazon. The last major fire season in the Western Amazon occurred in 2010. The resulting smoke pollution from that event affected nearly 500,000 people in Brazil alone. We saw an increase in respiratory illnesses, especially among children. Relating to climate change, it is interesting to observe how net carbon emissions of the Western Amazon differs during years of extreme droughts. In most years, carbon emissions from deforestation in the Amazon, biomass burning and decomposition of organic matter is mostly balanced by the forest’s CO2 uptake by photosynthesis. However, in years of extreme droughts such as that of 2010, the increase in frequency and intensity of the fires turns the Amazon into a source of CO2 to the atmosphere. Geraldine Tham is completing her Master’s in Climate and Society at Columbia University. She will then work for the Ministry of Education in Singapore. Her research interest is on how climate information can be better taught and communicated.